When your lawn is mowed so short that you inadvertently remove all of the grass blade and cut into the stem of the grass plant you can end up with a scalped lawn. 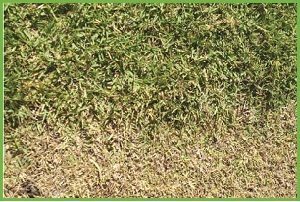 If you have scalped your lawn it can develop a scaled, sheared or brown appearance. Firstly, inspect your lawn to determine the most likely cause of the problem. If the scalping is uniform across the lawn then the likely cause is the lawn mower height is too low, the thatch layer is too thick and/or you have a heavy weed issue. If the scalping appears only in one area or a few small areas throughout the lawn then look for low and/or high spots that might be causing unevenness under the blades of the mower or the lawn mower wheels. Water the lawn deeply and gently a few times a week in order to encourage the lawn health. Keep in mind the current temperature and rainfall before applying too much water. Apply chelated iron to the lawn adhering to the manufacturer’s instructions and recommendations. An application of supplemental iron can encourage greening and growth. Apply a high quality topsoil to low spots on a gradual basis, about 2.5cms at a time, allowing the turf to grow through and/or onto the new soil in a dense manner before adding more soil. Mow the lawn at the height recommendation for the variety of lawn you have. Never remove more than one third of the grass plant in any one mowing. If your lawn is ever extremely long, raise the mowing height and gradually lower it with each mow. Never apply a fertiliser with nitrogen or a balanced fertiliser that contains nitrogen to a scalped lawn until it is fully recovered and shows no sign of scalping damage. Note: Browning or discolouration of lawn might be caused by dull mower blades so you might want to check on that. Always use a mower with sharp blades in order to avoid damaging your lawn. If there are any areas that are unable to recover from scalping, contact the team at Harden Park Lawns for further advice on how to repair your lawn. The laying of some new turf may be required to fix the problem.